This is an article published in our November 2017 Issue. Danish Special Forces are set to benefit from the MSS programme which aims to provide an enhanced SOTM capability for the wider armed forces. Despite the proliferation of electronic warfare (EW) technology across the battlespace aimed at disrupting tactical and strategic communications of armed forces, satellite communications (SATCOM) remains a critical element to any expeditionary operation. 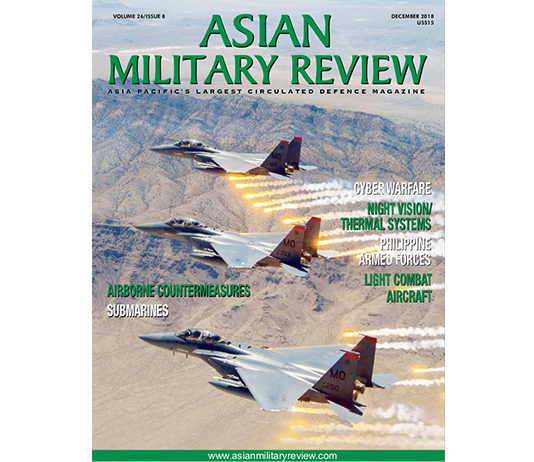 In the Ukraine, Asian Military Review understands from defence sources, that Russian proxy forces continue to conduct mature offensive EW operations against not only tactical communications systems but also unmanned aerial vehicles (UAVs) and intelligence, surveillance, target acquisition and reconnaissance (ISTAR) solutions, all of which continue to heavily rely upon GPS-data and SATCOM. 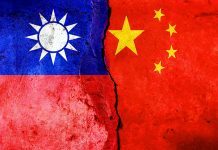 Sources explained to AMR how these EW and other similar cyber warfare attacks, provide a “highly effective” alternative to non-kinetic attack, with less likelihood of being traced and therefore condemned by the wider international community. Examples of Russian proxy interference against Ukrainian armed forces conducting the Anti-Terrorist Operation (ATO) include the jamming of VHF, UHF and GSM signals, as well as so-called full network suppression in some areas of eastern Ukraine. Such targeting of tactical communications networks has resulted in multiple armed forces around the world, including the US Department of Defense (DoD), continuing to consider alternative means of communications in the tactical environment including Mobile Ad Hoc Network (MANET) solutions. However, despite such disruption, developments in SATCOM continue to drive forward as armed forces seek greater coverage, improved security and increased throughput in data links, particularly to support forces deployed at reach. One of the most critical areas in current SATCOM development, remains the ability to communicate On the Move (OTM). Such a SATCOM OTM (SOTM) capability allows armed forces at the tactical level the ability to share voice and data communications efficiently and effectively while travelling in tactical ground vehicles at speeds up to nearly 130 km/h (80 mph). 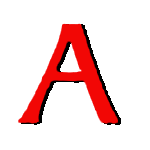 As defence sources associated with the international special operations community highlighted to AMR, the contemporary operating environment demands the capability to communicate while on the move in order to maximise intelligence cycles and reduce the so-called ‘kill chain’ as special operations teams in particular, seek to maximise operational success during rotations. Previously, teams would need to establish communications on-the-halt (OTH) in order to successfully transmit and receive to headquarter components as well as other deployed teams via SATCOM. This could mean individual units (callsigns) going static for periods of time in order to establish linkages with satellites without interference. In some theatres, where geo-stationary satellites remained almost overhead such as Afghanistan and Iraq, some force elements were able to establish a limited SATCOM capability on the move, although this lacked the maturity to be wholly relied upon and instead providing an intermittent service. The advent of SOTM however, is set to significantly impact upon the concepts of operation (CONOPS); tactics, techniques and procedures (TTPs) undertaken by ground force elements in multiple environments, where OTH drills may no longer be necessary. As sources explained to AMR, these revised TTPs continue to be developed by the SOF community in particular, as this type of SOTM capability continues to come online. Critical to any development in SOTM is the optimised reduction in size, weight and power (SWaP) of not only the radio set itself but also amplifying technology, antennae and ancillaries. Hence the reason why armed forces continue to attempt to find an optimal balance between transportability and power output in a single solution. One of the leading agencies globally considering a next generation solution in the area of SOTM is the US Special Operations Command (USSOCOM), which as AMR went to press, was preparing for the first deliveries of the next-generation Special Operations Forces Tactical Communications (STC) Next Generation Handheld (NGHH) and Next Generation Man Pack (NGMP) radio sets, both of which will be capable of enabling SOTM to the lowest tactical level. Addressing delegates at the Special Operations Forces Industry Conference (SOFIC) in Tampa, Florida, on 16 May 2017, USSOCOM J6 director, John Wilcox described how the “next generation of SATCOM has been evolving for a while”, with revolutionary change expected to be implemented between 2019 and 2020 with the optimisation of Medium Earth Orbit (MEO) and Low Earth Orbit (LEO) payloads. 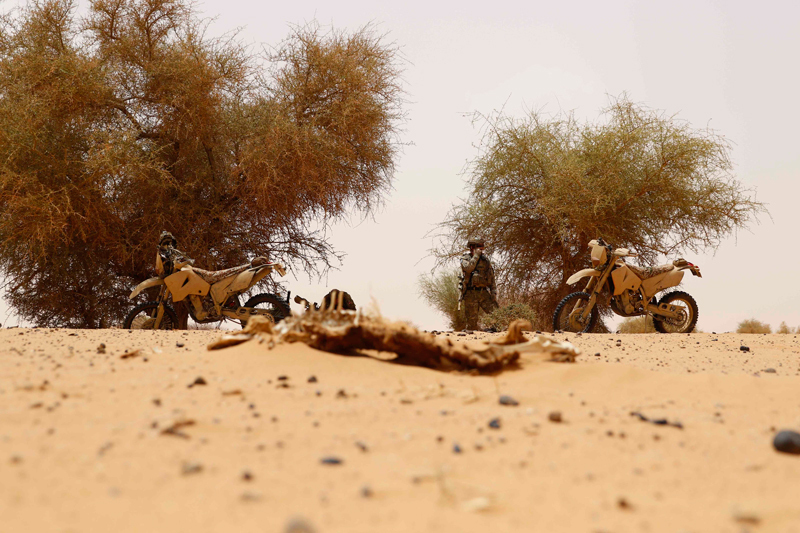 Wilcox explained how important the mobile environment (OTM) remained in respect to the successful execution of special operations in the expeditionary environment where “…operators must be able to operate anywhere at anytime”. He also called for 80 percent of the USSOCOM force to have mobile SATCOM capability by 2020, which not only refers to an OTM capability but also non-proprietary solutions capable of carrying multiple form factors and able to support mission sets across non-permissive, semi-permissive and permissive environments as demanded; in addition to the provision of SATCOM-enabled and untethered access to the SOF Command and Control (C2) network anywhere in the world. In 2015, Harris Corporation was awarded a USD390 million contract from the DoD to design, develop and field the NGHH as a small, lightweight, multiband, multifunction, multi-mission tactical radio to replace in-service AN/PRC-152 handsets. Similarly, in June 2017, Harris Corporation also won a $255 million contract from the DoD to supply more than 7,000 NGMP radio sets to replace legacy AN/PRC-117F and -117G models. 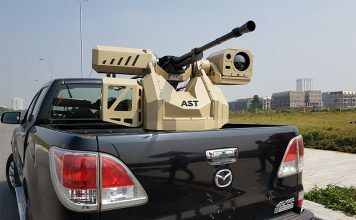 Both AN/PRC-152 and AN/PRC-117 radio solutions have retained a limited capability to conduct SOTM duties although company officials from Harris Corporation described to AMR how the STC family of systems will provide a truly next-generation capability to force elements. Another significant capability uplift for USSOCOM teams which will be integrated into both NGHH and NGMP variants to provide operators with a SOTM down to the lowest tactical level is the DoD’s Mobile User Objective System (MUOS) which has been optimised for use across the armed services through the US Navy. However, MUOS waveforms will also be integrated into legacy SATCOM terminals including Harris Corporation’s AN/PRC-117F and -117G models. Developed by Lockheed Martin, MUOS comprises an ultra-high frequency (UHF) SATCOM capability for ‘mobile forces’, according to company literature, which is capable of supporting mobile and tactical mission sets in the land, air and maritime environments. 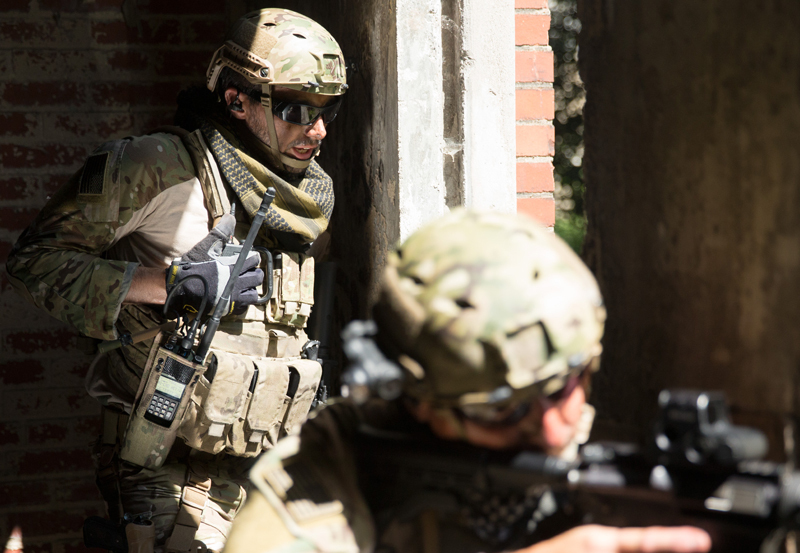 US Special Forces next-generation handheld and manpack radio systems will feature the ability to tap into the MUOS constellation for SOTM connectivity. MUOS will provide force elements with simultaneous voice, video and data across a high-speed Internet Protocol (IP) based solution, Lockheed Martin officials describe how the capability would “…seamlessly connect around the globe and into the Global Information Grid, as well as into the Defense Switching Network”. Wideband Code Division Multiple Access (WCDMA) waveforms as well as legacy UHF SATCOM waveforms, the latter of which will continue to be relied upon in the short term. The MUOS constellation also includes a fifth satellite as a spare, capable of filling any network deficiencies globally with Lockheed Martin officials claiming how the MOUS solution would provide up to ‘X16’ the capacity of current in-service systems. Furthermore and in line with emerging requirements from the operational environment, MUOS has been optimised for connectivity across the Arctic Circle. “Activity in the Arctic is growing as the polar sheet cap recedes. More people, shipping, exploration and search and rescue expose the need for secure communications to protect the region. However, getting satellite communications signal is extremely difficult. But not anymore,” a Lockheed Martin data sheet stated. The MUOS capability was most recently tested down to the lowest tactical level at the US Army’s Network Integration Evaluation (NIE) 17.2 exercise, which took place at Fort Bliss, Texas on 16 August 2017. According to the US Army Training and Doctrine Command (TRADOC), this latest iteration of the NIE saw teams using omni-directional antennae to connect tactical communications solutions to the MUOS constellation for SOTM. 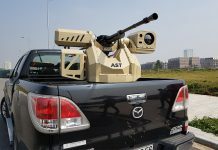 Force elements from the 101st Airborne Division’s 26th Infantry Regiment tested a variety of antennae in man-pack and vehicle-mounted configurations, ahead of full certification of the MUOS network, expected in 2019. Once this has been achieved, the army will be in a position to begin operational exploitation of the constellation in an operational context. In terms of the US Army, MUOS is set to be integrated into the army’s forthcoming Next Generation HMS (Handheld, Manpack, Small Form Factor) Manpack radio requirement (worth up to $12.7 billion over a ten year period) which is currently considering 101 variants from each of the programme participants which includes General Dynamics, Harris Corporation and Rockwell Collins. Omni-directional antennae currently available in the market include Spectra Group’s SlingShot which, according to defence sources, is currently being considered by multiple SOF components globally in order to ensure SOTM on foot and on vehicle as well as surface vessels. Spectra Group’s SlingShot technology allows dismounted and mounted personnel uninterrupted SOTM coverage, ideally suitable for expeditionary operations. According to Spectra Group business development director, Steff Taylor, dismounted force elements need to “…exercise command and control of widely dispersed forces in austere environments without the delay of deploying terrestrial infrastructures, or the operational burden of protecting and sustaining them”. 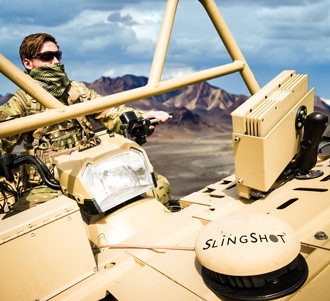 Available in manpack, vehicle, maritime as well as aviation configurations, SlingShot comprises an omni-directional antenna without loss of signal or quality, Taylor claimed. “There is no need to alter direction or stop to locate a beam, or stand or kneel to expose yourself,” he added while referring to changing CONOPS and TTPs. “As demand for better on-the-ground communication continues to increase, users of the latest modern military mobility equipment have begun focusing their attention on implementing the technology in SATCOM to deliver data to and from hostile environments. To then implement the latest SATCOM technology and to make it militarily and commercially viable has become the challenge for SOTM equipment manufacturers,” Taylor added. Spectra Group also informed AMR of the latest addition to the SlingShot solution, the Satellite Emulator (SSE), designed to extend the availability of power options to the holistic system. This includes an L-Band satellite emulator for full offline system testing without a live satellite channel; a Universal Power Supply solution affording flexibility in power needs; as well as an AA battery cassette capable of powering SlingShot in manpack form. Elsewhere, the Danish Ministry of Defence (MoD) has initiated the process to significantly improve its SATCOM capabilities in line with emerging operational requirements. In September, the Danish Defence, Acquisition & Logistics Organisation (DALO) triggered its Mobile Satellite Services (MSS) requirement, expected to comprise a total contract value of up to $3 million. Aimed at further enhancing the personal communication devices of the Danish defence armed forces, the MSS is aimed at fulfilling requirements in light of increasing demand for data-based communications in the future. “The communication is call-based as well as data-traffic. It is foreseen that the data based communication will increase going forward as the satellite operators plan to expand the communication and data capacity substantially within the period [four years] of the framework agreement,” DALO officials confirmed. Defence sources also demanded that the MSS satisfy emerging requirements across the Arctic Circle where Danish SOF in particular, continue to witness growing operational demands. SOTM terminals will also be supported by personal wearable phones with small weight and long battery, as well as fixed-mounted terminals similar to those already integrated on board surface vessels. “The satellite connection may also be in the form of a communication hub, connecting to other devices like smart phones or computers. The SATCOM device may also be connected to a VHF or UHF tactical radio to extend the range via a commercial satellite connection,” DALO literature adds. MSS will provide force elements with a 24/7 SOTM capability, supported by a management solution capable of monitoring both voice and data traffic as well as operational status of the satellite communication service. “Voice-based communication and data communication shall be routed to the Danish Defence internal communication network through dedicated connections and should, where possible, not be routed via the Public Switched Telephone Network (PSTN). In this setup a simpler control of cost and quality may be achieved. 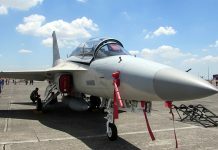 The access point for the satellite operator connection to the dedicated connection shall be located in a NATO country,” DALO officials added. Finally, the UK armed forces have moved a step closer to fielding their own next-generation SATCOM capability with a contract awarded to Airbus on 3 August 2017 to supply the Skynet 6A payload to replace the legacy Skynet 5. An official response from the MoD reads: The Skynet 6A transitional satellite (whose purpose is to extend the life of the current ageing Skynet 5 constellation) will be acquired through single source award to Airbus Defence and Space. The MOD reasserts that the more substantial and less time-sensitive elements representing the new Service Delivery construct and Enduring Capability retain their default competitive position. 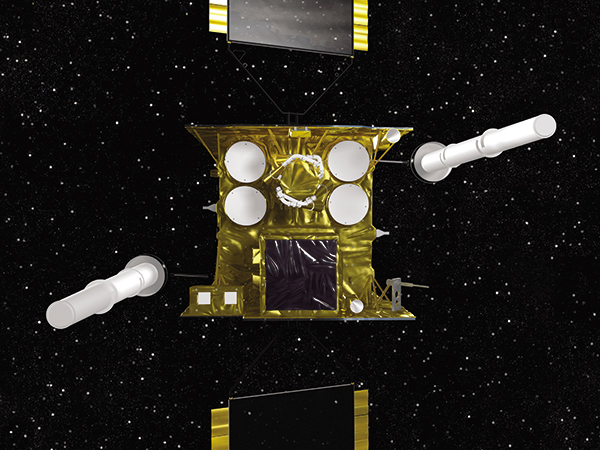 The UK Ministry of Defence has signed an agreement with Airbus to extend the Skynet constellation to fill projected future capability gaps in SATCOM services. However, Skynet 6A is not expected to become operational until 2025 with Airbus officials unable to provide further details to AMR at the present time. However, industry sources confirmed that the capability would include the integration of a SOTM solution in order to manipulated multiple platform types including the MoD’s high altitude pseudo satellite (HAPS), the Zephyr unmanned aerial vehicle (UAV). The Zephyr HAPS UAV is currently undergoing an evaluation with the MoD to consider its future utility as not only an intelligence, surveillance and reconnaissance (ISR) platform but also as a communications relay system capable of supporting its own organic network of OTM communications with dismounted ground users operating at reach. No matter how mature offensive EW capabilities remain across the modern operating space, requirement for effective and efficient SOTM connectivity will remain an integral element to armed forces conducting expeditionary operations. However, armed forces will need to consider alternative technologies such as MANET and High Frequency solutions should SATCOM become disrupted by enemy forces.